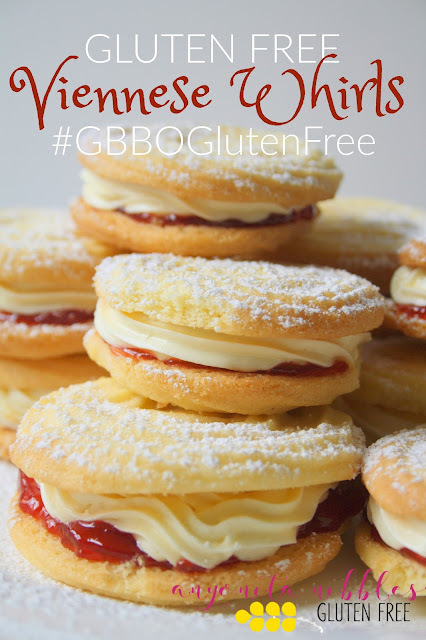 Thin as air, these gluten free cookies bake fast, so watch out! 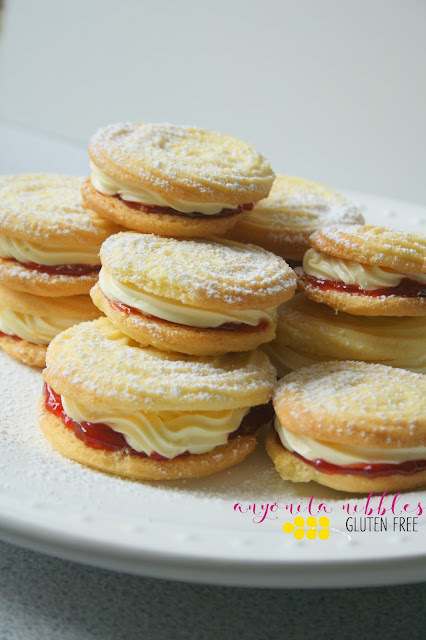 I filled my whirls with vanilla buttercream (you can find my favourite recipe in this post) and strawberry jam (make your own jam in the freezer with this recipe) or take a shortcut and use your favourite shop-bought jam and buttecream. It'll taste just as yummy! I used a gluten free all purpose blend that is mostly white and brown rice flour. Personally, I hate the texture rice flour gives bakes, so I added an equal portion of ground almonds. Traditionally, Viennese biscuits call for vanilla, but I use so much vanilla in my buttercream, that I didn't want it to overpower the subtle almond flavour and the jam, so I skipped it. I don't think the biscuits miss it all! If you'd like to use it, just add in a tablespoon with the butter. Preheat your oven to 190c or 375f. Combine the butter, gluten free flour, corn flour, ground almonds and icing sugar in a food processor until mostly smooth. (If you are using a tablespoon of vanilla, add it now.) To get the classic Viennese ridges, make sure you don't overmix! Spoon the batter into a piping bag with a star nozzle. 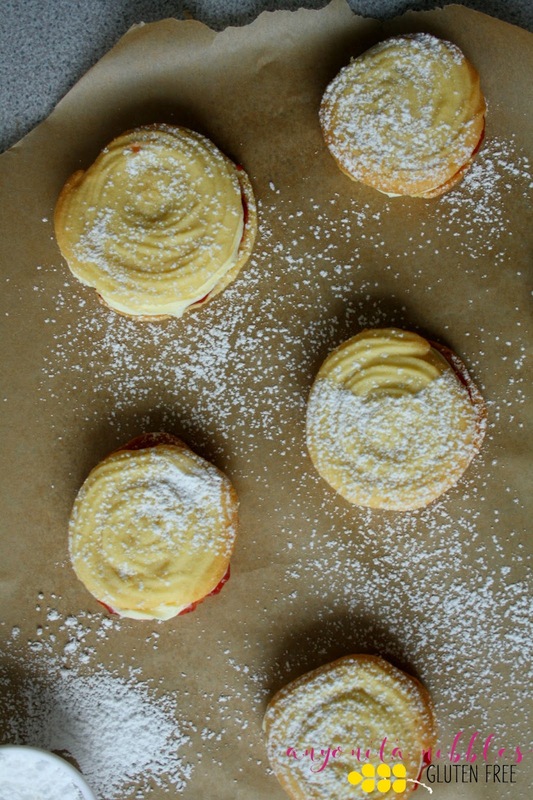 Pipe the biscuits into circles any size you'd like, just try to make them uniform. Bake in the oven for 9 minutes or until golden brown. My first batch (the burnt ones) baked for 12 minutes. While the biscuits bake and cool, whip up your buttercream and make your jam. To take the pressure off, I'd recommend making the jam a day or two before or just using shop bought. Once cool, gently spread some jam on the bottom biscuits. Be careful - the thin cookies will be fragile! Spoon some buttercream into a piping bag, again fitted with a star nozzle and pipe on top of the jam. Be generous with the cream, there's not much sugar in the cookies, so the sweetness really comes from the buttercream. Top each cookie off with another to make a sandwich, then sprinkle with a bit of icing sugar. These look and sound delicious. I love the almond and vanilla flavors combines. 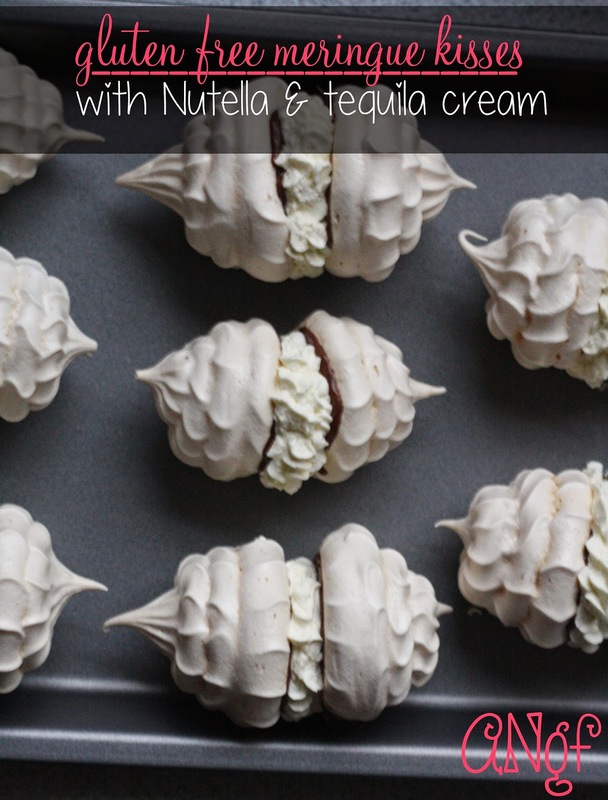 I'm feeling these for tea time! Such a beautiful delicate looking cookie! Are they really that easy? They are just gorgeous! These are beautiful! 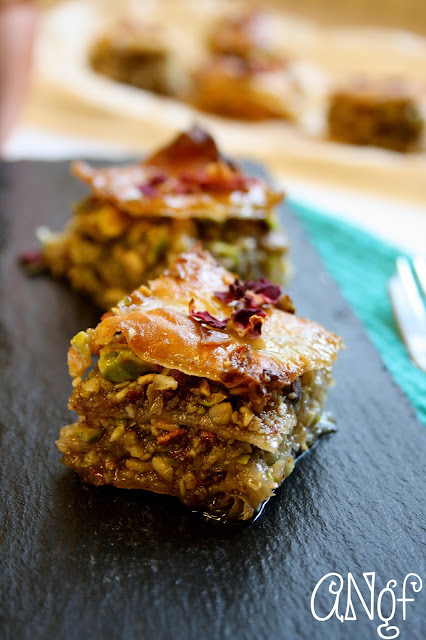 As are all the recipes that you have linked here. I'm super impressed that they are all GF as well. Great work! I need to visit your blog more often! 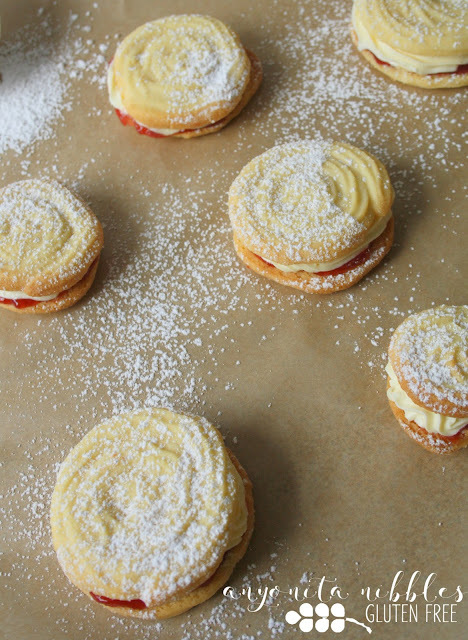 These Viennese whirls look great! 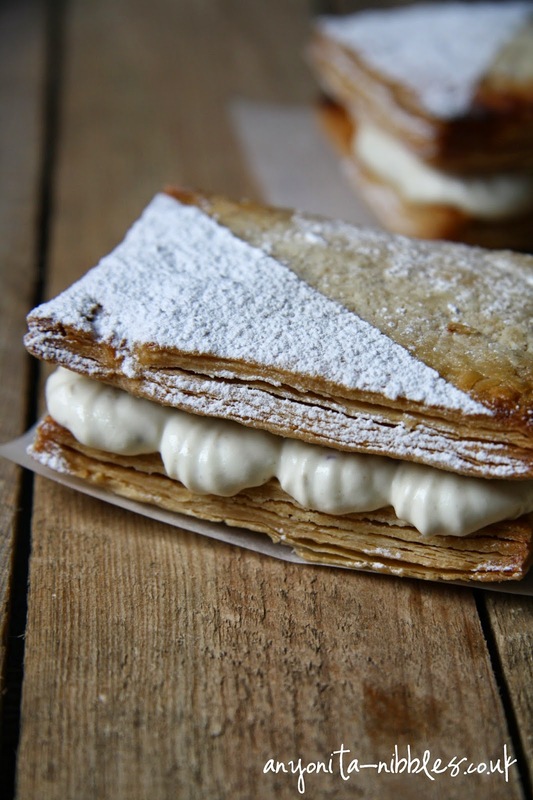 Love that these are gluten free and are easy to make! My kids will love these! lecker die Kekse. 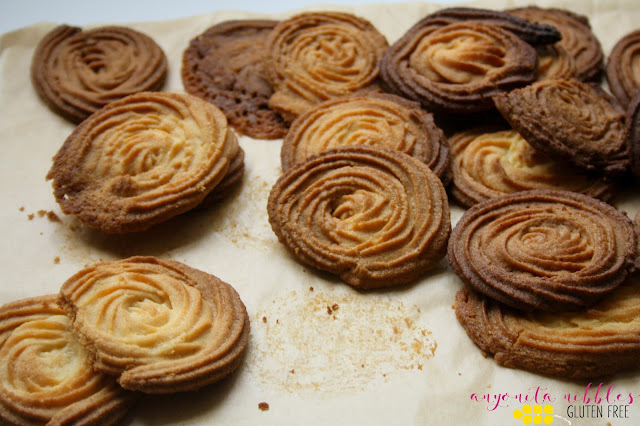 Die Whirls habe ich mir gleich ausgedruckt und gehe gleich backen.